Pull Apart Bread has been on my ‘to do’ list for a long time. I’ve done mini ones in a muffin pan, but wanted to bake one in a bundt pan. However, the bundt pan part didn’t really work out but the pull apart bread got baked. My daughter keeps on insisting that she’s not going to eat much carbs, so initially I tried baking half the recipe to give a small loaf. First all, its the first time I’m halving a basic bread recipe so forgot that I should add less salt. The small miserable looking loaf didn’t come out too well and it was salty. However, my daughter liked the idea of tiny pieces of bread stuffed with cheese so she insisted that I bake one for her to take to work. That was a relief as I now could bake the normal 3-3½ cup flour bread. I used a small cake tin and the shape came out much better, the rise was good and yes it wasn’t salty. Pull Apart Breads is the November theme for Bread Bakers suggested by Kelly Lawson who blogs at Passion Kneaded. She has an awesome collection of Muffins and Breads. Pull Apart Breads or Monkey Breads is a great way to serve bread at parties, or if stuffed then as a starter too. Pull Apart Breads can be sweet or savory and I chose to bake a savory one. Who can beat the taste of butter and garlic with a bit of herbs added. However, I decided to first stuff the bread with tiny cubes of cheddar cheese, then coated the balls with the garlic butter. 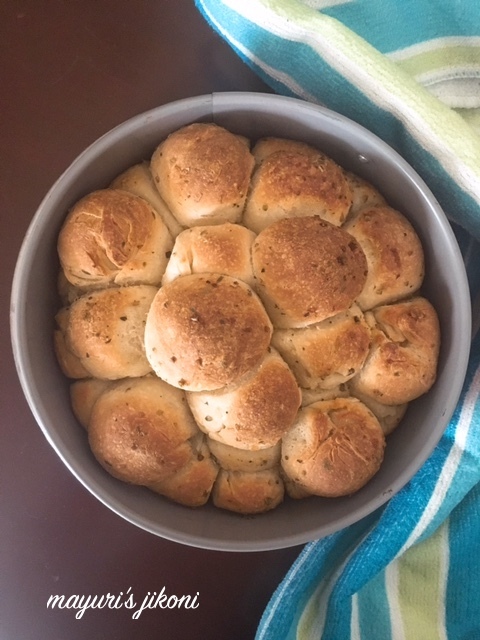 Check out the recipe and go on try your own version of a pull apart bread or try what fellow bakers have baked for this theme. Add 1 tbsp oil and rub it into the flour. Dust the worktop lightly with some flour. Knead the dough on the worktop for 8-10 minutes until it is soft and smooth. The dough may stick to your hands but keep on adding the remaining oil as you knead. Grease the bowl with butter or oil. Form the dough into a ball shape and place it in the bowl. Very lightly dust the worktop with some flour. Gently press the dough to degas it. Divide the dough into 4 parts. Use a sharp kitchen knife or a scrapper to cut the dough. Divide each part into half. So now you will have 8 parts. Divide each part into half to get 16 parts. Divide each part into half to get 32 parts. Let the dough ‘parts’ rest for 5-10 minutes. In the meantime cut the cheese into 32 cubes or parts. Make the coating by melting the butter over low heat or in the microwave oven. Add garlic and herbs to it and mix well. Grease a small cake tin (about 6-7″ in diameter) with some butter. Take one part of the dough. Flatten it slightly with your finger tips. Place one cube of cheese in the middle of the dough and roll it up. Coat the rolled ball with the melted garlic butter. Place the ball in the prepared tin. Repeat steps 22 – 25 with the remaining dough pieces and cheese. As you place the coated balls in the pan, make sure you arrange them well. Cover the pan with a damp kitchen towel and let the bread rise again for 45-60 minutes. Place the pan with the risen dough in the oven and bake for 30-35 minutes till the top is golden brown. Remove the pull apart bread from the oven. Pour any remaining melted butter over it. Remove it from the pan and serve it warm. Serve this bread with soup, salad or as a side dish. Don’t be in a hurry to remove the bread from the pan otherwise it will fall apart. Stuff it any cheese of your choice. This bread looks so gorgeous it would be great to serve at a dinner party with some soup as a starter. Any recipe that starts with the words “Cheese Stuffed” has my vote. Wonderful recipe, Mayuri. Love the addition of cheese inside Mayuri. Cheese stuffed garlic pull apart bread sounds delicious, great with any hearty soup! Nice and simple one. I love home made breads. I'd just love to tar into this bread. I just love garlic and cheese together! ummm.. I love a bread that is stuffed with cheese!~ Your bread sounds really yummy with cheese and garlic. I love the little bits of cheese in the middle. The way you piled the shaped balls in the cake pan looks wonderful. I may have to try this for Thanksgiving. Hello Mayuri, Wahat a pretty cluster of garlic cheese bread! I loved your idea of stuffing thr rolls with cheese cubes and then coating in garlic butter. What a heavenly combo! That sounds like a very flavorful bread with garlic and cheese. Cheese stuffed garlic pull apart looks perfect to enjoy for mid day meal. Garlic pull apart looks yummy and I love this recipe! Looks so beautiful.. loved the detailed recipe.. Always like cheese stuffed treats.. This is really awesome !! Tasty pull apart bread. I do need to try this. Cheesy soft, fluffy pull apart rolls. So tempting. Cheesy and beautiful bread, love it. Wow, I love this bread Mayauri. Must try making it for my cheese crazy hubby. Pull aparts are my favourites too. Fuss free eating and tiny bites can be savoured with a cup of tea or coffee. Stuffed ones are even more tempting. A great brunch option or a party pleaser, bread baking is certainly great! Loved the puffed up bread and the spongy interior. Thanks Poonam and do let me know how it turns out.